Roque Bluffs State Park near Machias, Maine. Photo courtesy of NEO Dave. Located on Schoppee Point, Roque Bluffs State Park offers unique beach opportunities for visitors. The park borders Englishman Bay and provides a lovely, half-mile crescent beach of sand and pebbles. After a chilly swim in the saltwater of the bay, walk to the other side of the beach to hop in Simpson Pond. This 60-acre freshwater pond is warmer than the ocean water, providing swimmers with the best of lake and ocean swimming opportunities in just one beach. Enjoy the picnic areas and hiking paths near the beach, or rent a canoe or kayak to explore the bay. Pets are permitted in the park, but dogs are not allowed on the beach. Although the park is only staffed from May to October, visitors may enjoy the beach and trails during any season. The cost is $3 for residents and $4.50 for non-residents; call 207-255-3475 for more information. 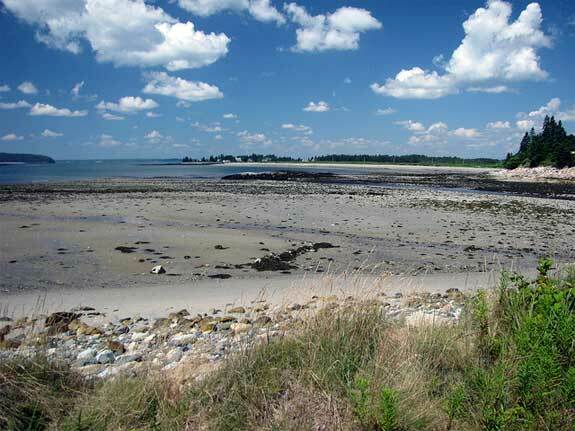 Located near Deer Isle, the Causeway Beach is a small stretch of sandy beach at Scott’s Landing. Managed by the non-profit organization the Island Heritage Trust, the beach area is open to the public. At low tide, explore the beach to find tiny creatures that live below the high tide line. Swimming is permitted at the beach, but there are no toilet or shower facilities available. Dogs are permitted on Causeway Beach if they are on a leash. Call the Island Heritage Trust at 207-348-2455 for more information. Acadia National Park is truly one of Maine’s greatest treasures. The park covers 47,000 acres of mountains, hardwood forests, ocean shoreline, and lakes. Two beaches are available for swimming and are staffed with lifeguards during the summer. Sand Beach offers ocean swimming, with chilly water temperatures rarely exceeding 55 degrees. If you are looking for a warmer swimming experience, visit Echo Lake Beach on the west side of the island. Both beaches are continually monitored to ensure high water quality. Although other park lakes and oceanfront areas have beaches, these are often protected areas that do not permit wading or swimming. Feel free to walk along these beaches but do not enter them. Entrance fees to Acadia National Park are $20 for seven days or $5 for one-day access. Call 207-288-3338 for more information.